A white pizza dip full of garlic, cheese, roasted tomatoes and a couple surprise ingredients. 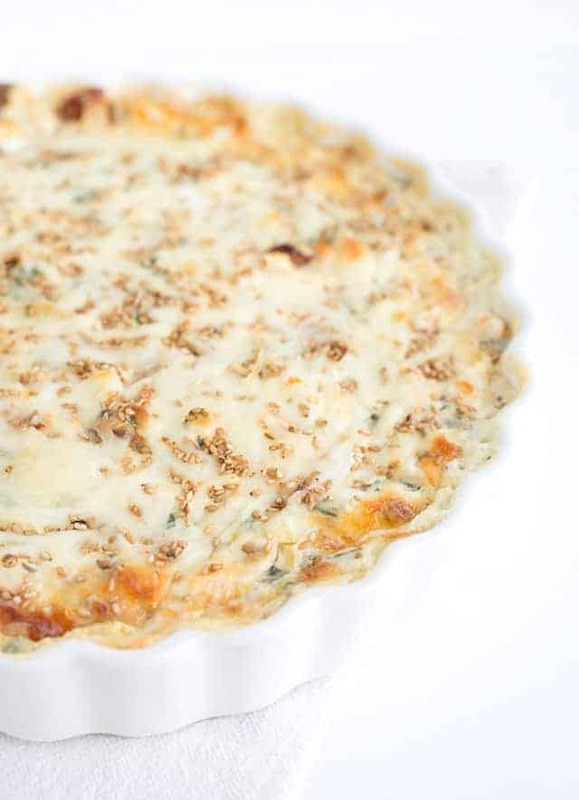 It makes the perfect appetizer for any white pizza lover. 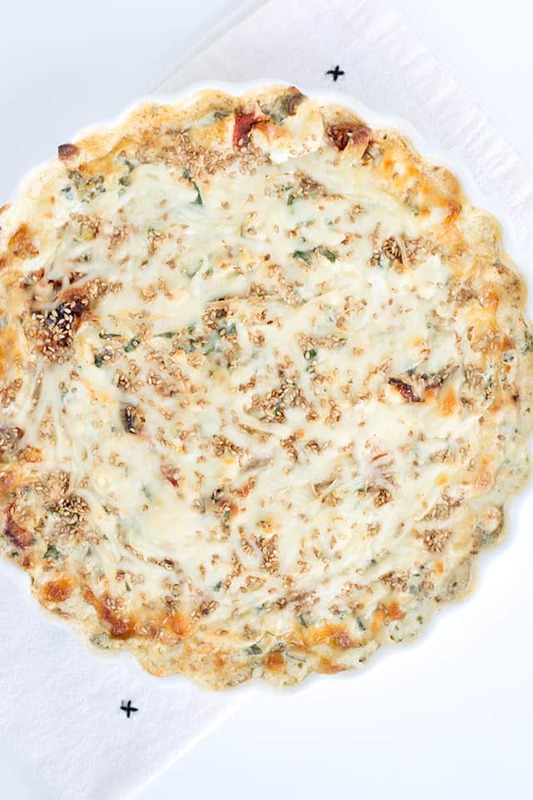 This white pizza dip recipe is inspired by my favorite pizza place’s white pizza. They shut down the business after the owner passed away and I’m left trying to satisfy that craving. I think I nailed it too. Roasted tomatoes, spinach, sesame seeds, loads of cheese included feta cheese and garlic, all the things that were loaded on their white pizza. This is a white pizza dip without soup mix. The flavor comes mostly from the 4 cloves of garlic that’s been added in. You are going to have some garlic breath. It’s a fact. If you eat it, make sure your other half eats it too. It’ll cancel each other out and then no one has to listen to any complaints. This is basically a garlic mozzarella cheese dip with a lot of add-ins. It’s the perfect hot dip to serve at any party! Roast the cherry tomatoes until very little juice comes out of them. That will keep the dip from becoming super runny. You can swap out fresh spinach for frozen spinach that has been well-drained. You can get away with leaving the feta, sesame seeds, spinach, or roasted tomatoes out of the dip. I added them for flavor and because this is what I loved on my white pizza. Make your dipping chip something that can hold a nice scoop of dip. I recommend the scoops corn chips or the bagel chips. Can this be made in a slow cooker? I think so, but I haven’t tested it yet. I plan on making a crock pot version in the future! Do I have to roast the tomatoes? Yes! Otherwise, you’ll have a runny, watery dip. Can I use frozen spinach instead of fresh spinach? Yes. Just make sure it’s well-drained. Can I substitute the sour cream for greek yogurt? Yes. 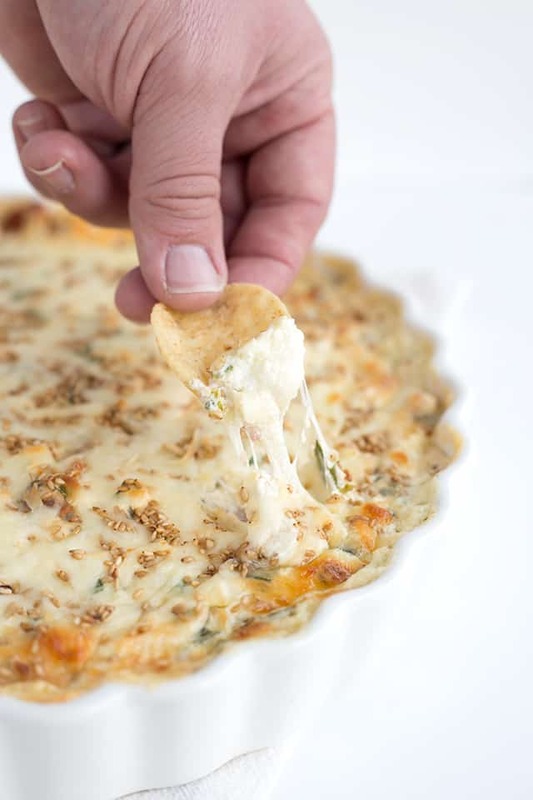 White Pizza Dip that's perfect for any party! It's loaded with cheeses, roasted tomatoes, spinache, and lots of garlic. Add the tomato halves to the pan and drizzle with olive oil and salt. Toss them to make sure they're coated and spread them out onto the prepared pan. You can remove the seeds of tomatoes if you want, I did not. Bake for about 35 - 40 minute until the tomatoes are mostly dried up. If you remove the seeds, it may take less time to roast them. Set aside and work on the rest of the dip. In a large mixing bowl, add the cream cheese. Beat on medium with a hand mixer until creamy. Add 1/2 cup of the sour cream and mix until incorporated. Add the remaining sour cream and beat until combined. Add the garlic, provolone, 1 cup of mozzarella, and feta cheese. Stir with a spatula until thoroughly incorporated. Spread into a baking dish. I used a 9-inch ceramic tart pan. Add the remaining 1/4 cup of mozzarella on top of the dip. Sprinkle with sesame seeds. 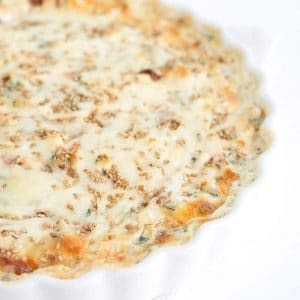 Place into the oven and bake for 25 - 28 minutes until the cheese around the edges of the pan is golden and the dip is bubbly.